I love my family. My oldest walked by my desk which was covered with various picks, practice locks, and various tools. She asked what I was doing: “Learning to pick locks”. She just walked away, no eye rolling, no surprise, just acceptance. My wife had the same reaction. I love that no one questions my various educational endeavors. My grandfather was a locksmith and I always thought it would be interesting to see what locks were all about. Also, being able to pick locks would be really cool. One hour after receiving my set I was able to pick the practice padlock in fairly short order. 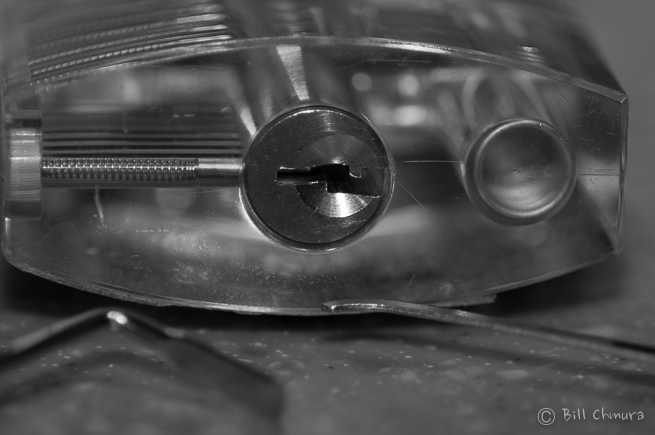 The practice padlock is transparent so you can see what you are doing and how it works. To up the difficulty level I taped over the lock and within another hour was able to pick it by feel. I learned at least three techniques to defeat locks in the process. “pin picking”, “raking”, and “bump keys”. The mechanism of a lock is simple to understand and like most computer security attacks, picking a physical lock seems to rely on imperfections in the design and manufacturing. I can confirm that when you see an actor on TV whip out a lockpick set and get by a door in 30 seconds or less, it is definitely possible. As a hobby, the investment was fairly minimal and you can find everything you need to get started on Amazon.com and YouTube. The set I purchased was fairly extensive but I surely don’t need everything that came with it. After my experience I would say look for a set that comes with a transparent practice lock, under a dozen picks, and includes at least one or two “rakes”.